When people talk about balance in life, there are usually spiritual, physical or social elements to the practices that should be adopted for healthier results. The circadian rhythm is not often discussed nor the correlation between your body’s sleep-wake cycle and its effects on your overall well-being. For nearly 10 years, Michelle Gumz has been diligently studying the circadian clock gene Per1 and its connection to the kidney and other bodily functions. By asking specific questions in science, she is unearthing information about how our bodies operate and how this can change the way we eat, sleep, work and play. What can be discovered along the way may change the social world as we know it. Q: What led to your work in studying the circadian clock gene? 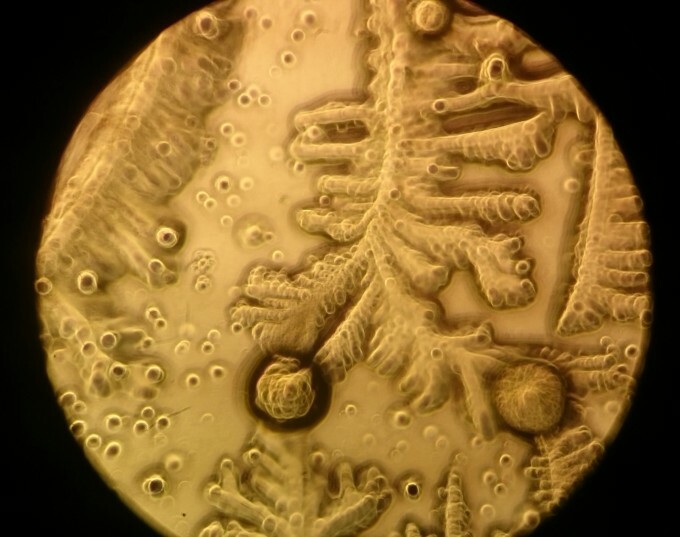 A: I became interested in the circadian clock related to an experiment I did when I was a graduate student with Dr. Brian Cain in the UF biochemistry and molecular biology department to study ion transport in the kidney. One of the key regulators of sodium transport is the hormone aldosterone. In collaboration with the Wingo Lab, we performed a microarray study looking at the effects of aldosterone on kidney cells and culture. The results of that microarray study showed that the number one most highly induced gene was the circadian clock gene Per1. That finding was published as part of my graduate work and it was something that I remained interested in years later in my post-doc. Q: How did it feel to be the first scientist to identify the circadian clock gene Per1 as an aldosterone target? While studying salt in the kidney, these crystals formed on an agar plate during incubation in the Gumz Lab. A: Pretty exciting… It was definitely unexpected and I think at the time, ­­when I was a graduate student, I didn’t appreciate the clinical relevance of that finding and it was later in my post-doc when I started to put two and two together; that there are circadian rhythms in blood pressure and there are circadian rhythms in kidney function and maybe that was related to our earlier finding that a clock gene was upregulated by aldosterone. That really led to this question, “Is this molecular regulation of a clock gene by a sodium regulating hormone related to the circadian rhythms in renal function and blood pressure?” That exact connection is something that we are still working on. Q: What do you hope to accomplish with the publication of your new book, Circadian Clocks: Role in Health and Disease? A: I hope it will bring attention to the area that humans do function on a circadian cycle and that taking a blood sample from a patient in the morning might give you different results than what you might get if that same patient shows up in the ER in the middle of the night. Also, that time should be something we’re thinking about in terms of not just basic research and using animal models but also in clinical research and in a clinical setting, [such as] providing the best care for patients. Q: What other research projects are you involved in at this time? 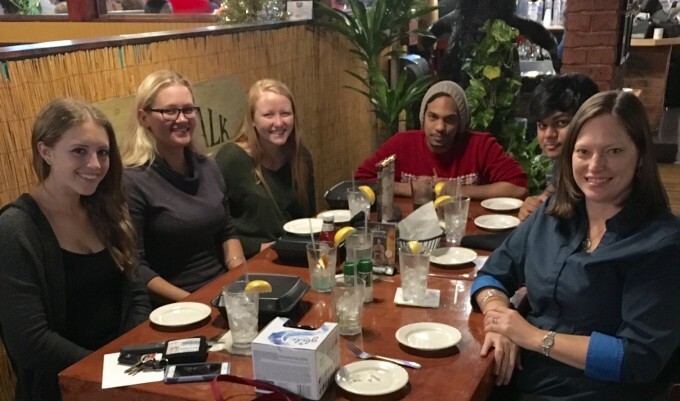 A: One of the things that I love about the University of Florida is that there are a lot of broad interests here and especially within the Division of Nephrology. I have a couple of different collaborators who are working with my lab. Dr. Muna Canales is a Nephrologist practicing at the VA Hospital and she’s conducting a study on sleep apnea in veterans which has direct implications for understanding their circadian rhythms. There have been some studies in the wider medical literature that sleep apnea, like other forms of sleep disruption, causes circadian disturbances and that is going to have long term adverse health effects. We’re doing a type of ancillary study to Dr. Canales’s study to look at clock gene expression in the peripheral blood of the people in her sleep apnea study. We’re also doing something similar with our division chief, Dr. Mark Segal, in a study with patients that he sees for lupus nephritis, an auto-immune disorder where the kidney can be affected. One of the issues in that pathology is poor sleep that leads to circadian disruption which can exacerbate symptoms of the disease. My lab has a long standing collaboration with the Cain Lab in Biochemistry and the Wingo Lab in Nephrology to study endothelin signaling in the kidney which is relevant to diabetic nephropathy and hypertension. 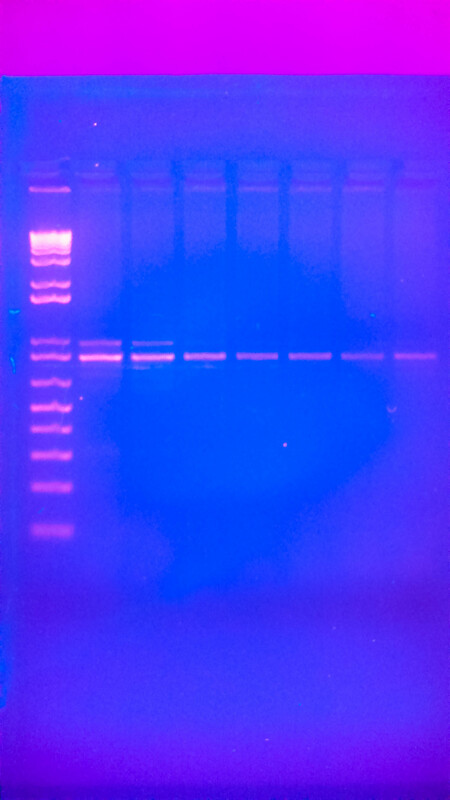 Photo of DNA profile obtained by polymerase chain reaction (PCR) used to look at gene expression with a UV-transilluminator. Q: How do you balance your life and work obligations as a mother and scientist? A: It’s challenging, I am fortunate that my husband and my children (who are old enough now) appreciate what we’re trying to do in the lab. Because I have two daughters I feel even more invested in trying to set a great example for them; that women in science and other fields can be just as successful as men. So I hope I’m setting a good example for my daughters and other young girls and women. I gave up on the idea long ago that any kind of “balance” is long lasting. It’s more like a teeter totter and sometimes work has to take the priority – if we’re pushing to get a paper finished or if a grant deadline is approaching. Other times the teeter totter shifts toward my personal life. I feel that in the long term it balances out.. I always make it a point to save my vacation time so that I can take off time for Spring Break, Winter Break and some time in the summer and get that great quality time with my family. Q: Do you find it difficult to acquire grants for your research? A: That’s definitely a very challenging area of what we do especially in the current funding environment. When I was a graduate student it was sort of in the “good old days”, if you will, right around the time the National Institute of Health (NIH) budget doubled. At that time, I think pay lines were in the range of 25%-30%. Those pay lines have fallen pretty drastically and for every hundred grants that are funded, depending on your specific area of research, maybe only six or seven get funded. If you’re lucky, maybe it’s twelve out of a hundred in a different area of research and so that is extremely challenging. What we’re doing now to combat that is to just continue to do the most rigorous research that we can do and to be persistent in our applications for funding. Q: What do you think is the most important aspect of your research that you would like the general public to be aware of? A: One of the things that I like to really emphasize is the importance of a good night’s sleep. Something I joke about since I got into the area of circadian biology is that I will favor sleep over other physiological processes in my life. That’s because I have seen at the molecular level the effects that circadian disruption can have and how that leads to different pathological states like hypertension or kidney disease and cardiovascular disease. In a newsletter put out by the American Physiological Society, I recently wrote a commentary, How to Find More Hours in the Day, and in order to do that you should actually get more sleep so that you’re more productive and make better use of your time during the day. Also, it can be really beneficial to keep the same schedule between work days and rest days or school days and weekends. The reason most of us feel terrible on Monday morning is because we’ve effectively given ourselves jet lag over the weekend by staying up late and sleeping later. There’s a name for this phenomenon – “social jetlag” and it negatively affects your sleep-wake cycle. I try to emphasize: get a good night’s sleep, keep the same schedule and be consistent with your meal times and bed times.